ACC's SkillsUSA competitors win big at state competition! Are you taking Welder Qualification? See here for Spring 2019 testing dates. See here for Summer 2019 testing dates. Study abroad with Welding Technology! Take welding class Koblenz Germany in summer 2019. See here for more information. Come to the first day of class ready to work! View the list of equipment/ supplies required for college credit or for continuing education classes. How do I get started? How long will it take? What will it cost? Get answers to common questions here. Check us out on Youtube: ACC Blacksmithing on Youtube and Meet ACC Welding Student Janelle Engel on Youtube. Forging a career: ACC student follows passion to become a better engineer. Donate to the Henry Stone Memorial Scholarship. Professor Tim Strouse is recognized for his outstanding contributions in welding education. Read more. Our Mission is to provide unsurpassed technical training and industry relevance toward a career for the student aspiring to become a certified welder, welding inspector, or respected metal artist. Many people are unaware of the tremendous scope and potential offered by welding technology. It is such a diverse field that there is an application for virtually every personality type. It is no exaggeration to say that our students are learning to manufacture everything from drawer pulls to skyscrapers. To meet the needs of these ever-expanding disciplines, we offer a number of flexible formats offered through individual courses, specialty certificates, and even comprehensive college degrees. The ACC Welding Technology Department endeavors to maintain excellence throughout the many facets of Welding Technology. 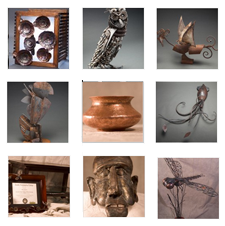 The unique offerings of this department include Technical Welding, Welding Inspection, Metalsmithing, and Metal Sculpture. These programs are recognized in quality and relevance, and are one of a kind nationally in such diverse offerings. Our graduates will possess the skills and knowledge to thrive in any local, regional, national, or even global economy as Welding Technologists. The Welding Technology Department is located in Building C on the Riverside campus and in Building 5000 on the Round Rock campus. All continuing education, Art Metals, and Welding Inspection classes are taught at the Riverside location.